Ralph Erenzo, co-founder of Tuthilltown Spirits, transformed an old grain mill in Gardiner, N.Y., into one of the state's first boutique distilleries to open in New York since Prohibition. A century ago, New York could claim that much of its liquor was local, thanks to distilleries large and small that supplied a lot of the whiskey, gin and rum that kept New York City (and the rest of North America) lubricated. Then Prohibition arrived and the industry largely dried up, before trickling back to life in the 21st century. Now, distillers in New York state are toasting a revival 80 years in the making. Tuthilltown Spirits is one of the first boutique distilleries to open in New York since Prohibition. It's been 12 years since co-founder Ralph Erenzo bought the property in Gardiner, N.Y., a rustic corner of the Hudson Valley about 75 miles north of Manhattan. In his first career, Erenzo owned a climbing gym in New York City. He was looking for an agricultural product he could make in the Hudson Valley. Then Erenzo found out about a recent change in New York law that cut the licensing fee to open a small distillery dramatically — from $65,000 to just $1,000. "We knew less than nothing about this business," says Erenzo. 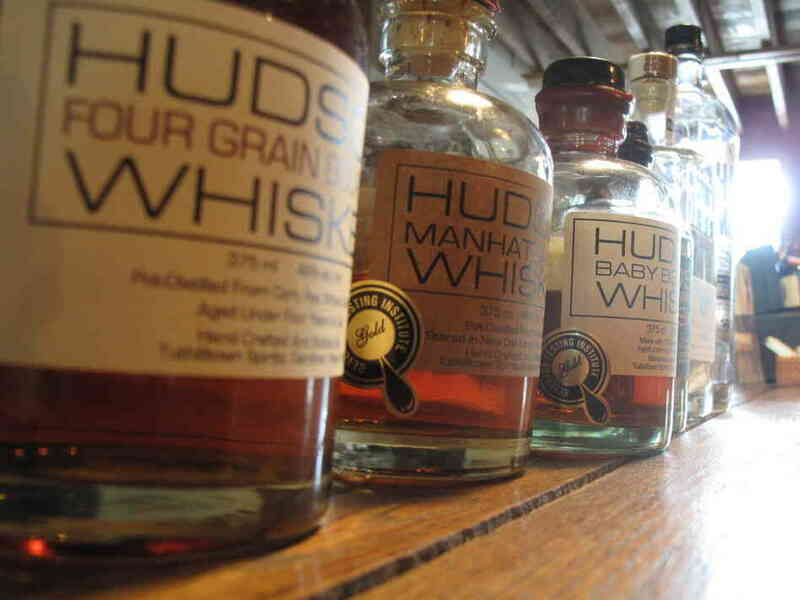 But today his distillery turns out thousands of bottles a day, many under the brand name Hudson Whiskey. The first spirit he created is a clear, colorless corn whiskey. "It's clear like this because it doesn't go into an oak barrel," he says. "This is right off the still. Legal moonshine, you might say." That corn whiskey may be clear, but it's definitely not weak. The flavor is sweet, grainy and boozy. Hudson also sells something darker, the color of maple syrup. The flavor is more complex, with hints of caramel and vanilla. "[It] is the first bourbon whiskey ever made in New York," says Erenzo. "And it was the first aged whiskey legally made in New York since Prohibition." Tuthilltown Spirits in New York makes a clear corn whiskey, and the first legal aged whiskey in the state since Prohibition, among other products. Now there are dozens of distilleries operating in New York State, from the Adirondacks to Brooklyn. At the Shanty Bar, attached to the five-year-old New York Distilling Company in Williamsburg, Brooklyn, co-founder Allen Katz pours a cocktail with the company's Perry's Tot Gin. It's made with juniper and nine other botanicals and spices, including coriander, citrus, star anise and even green cardamom pods. Katz says the landscape of emerging distilleries in New York harkens back to the heyday of the state's liquor industry. "If you go back to the 1800s, people were making all different types of spirits," says Katz: gin, whiskey, rum and apple jack. There was also a widespread appreciation for those spirits in New York's thriving bar culture; then, the 18th Amendment put a stop to legal alcohol production. The distilling industry in New York then either disappeared, or went underground. "It not only killed the bar culture, but it killed our taste buds," says Katz. "The idea of having quality spirits behind a bar in a consistent nature really became forgotten." Prohibition ended in 1933. But it was already too late for small distillers in New York who'd gone out business. Today if you look behind most bars in this country, you're likely to see the same few mega-brands of whiskey, gin and vodka. But that's starting to change as the growing interest in local food, beer and wine moves into the hard stuff. The rebirth of New York's distilling industry is drawing in entrepreneurs from other lines of work. "I used to have a desk job that I hated," says Brad Estabrooke. When Estabrooke lost that desk job as a bond trader in 2009, he opened Breuckelen Distilling in an old warehouse near the Brooklyn waterfront. Estabrooke's operation is basically a higher-tech version of the same thing distillers have been doing for centuries. He starts with local grains and lets them ferment in big tanks. Then he boils the results in a copper still to release the highly alcoholic vapor. "The idea that we are bringing in ingredients and actually making something — that is the part that makes me feel like we're connecting to this ancient, old activity," says Estabrooke. When I ask if he's making as much money as he was in his original career, Estabrooke laughs. "No, not even close," he says. Though Estabrooke adds that the company should turn a profit soon. At Tuthilltown Spirits back in the Hudson Valley, Erenzo has already scaled up to employ 26 people. He says craft distilleries are starting to have a real economic impact in New York, and beyond. "People are getting hired. Old buildings are being reused," says Erenzo. "A craft is being reestablished in this country that hasn't existed for 70 or 80 years cause of Prohibition. People are building cooperages and malt houses. This is a rebirth of a whole industry." But this new spirits industry is not exactly like the old one. Many of the new distillers are less tied to tradition, and "willing to try just about anything," Erenzo says. And that's making it a very interesting time to pour a drink.